The contact us icons are used and needed in multiple projects. Any website needs contact us icons. Any poster, ad, banner, flyer, brochure, visiting card, or invitation card by default need the contact icons. This means you design anything with contact information on it, and the contact icons will be useful. That is why designers also constantly look for fresh sets of icons to bring in variety in their work. This helps them a lot to create fresh looks and stay away from repeating same designs again and again. Here are some smart looking contact icons which are in grayish black color tone, and they cover all your needs. Email, phone, 24×7 contacting and all common contact mode types are discussed here. Line drawn contact icons, all in round shape, with a white background are here in this set. The black lines makes each deign prominent and you may use these in multiple ways in several designs. This is a set of 10 vector contact icons. The white line drawn elements in the rounded corner square icons are highlighted on royal blue background. 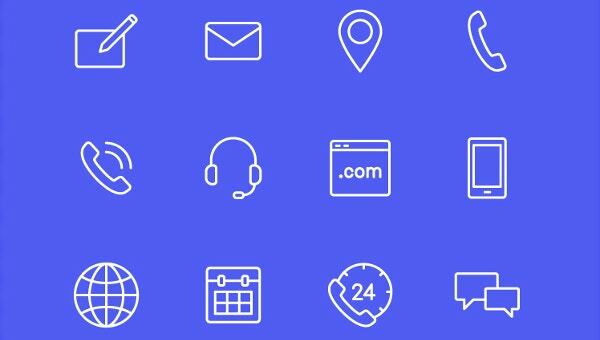 The most common types of contact icons that you may often need to use are listed here. All these icons are colored, and would give a smart definition to your designs. Here are amazing round icons for contacts, and they are all based on dark blue, with white design on them with special elevated effect. They would be bright on any light background design. You can also see Airplane Icons. Candy colored round icons are here to add to more colors to your designs when you use them in style. They have an extra shadow effect in them running from element body to periphery of circle. All modern day contact icons with smart inclusion of smartphone based designs and Wi-Fi etc are here in this pack. All are round shaped and contains only black lines on the white background. Modern style contacts which also include memory cards and chips are here in this pack, and the darkest blue shade icons are simply element shaped to give you a flexible design, and you may include them anywhere. Here are silver grey icons in rounded corner square shapes, and they all contain the image of the contact element in black. They are glossy finished and attractive. You can also see Free Icons. All common and stylish contact style and shapes, icons and signs are here in this pack, and they are simply line drawn in bluish black color and are extremely flexible to be used anywhere on a light background. Icons emerging out of envelopes are the theme design here, and all icons in this pack contain the same style. Every icon corresponds to a different mode of contact in candy colored glossy finish. Here are 7 groups in the file, and each group contains 7 different icon styles, and each style has a mix of modern to vintage contact modes in their icons. Most of the black icons in this group contain a square to rectangular design or layout, and they all contain recent and modern day contacts. You can also see Web Icons. This is one single icon in this file or pack, and the icon is a blue round shape glossy button at an angle showing the sign of a phone and an envelope. Lots of square icons are here, and all of them show the contact element in white on blue, and with the shade effect to give a 3D style. These contact icons come in various shapes and styles, and you get round, square, and original shapes for light and dark backgrounds. Therefore all your contact icon related needs are met here when you surf through these links. You can also see Party Icons.